Are Your Arms Open or Closed? Josh was stunned. He imagined so many scenarios of how the reunion would go, but never did he imagine the response he got. He had been a young boy when his mother remarried and moved away from his paternal grandparents. The college years were busy with studies, working, and friends, and time slipped away from him. Now, as a young 20 something, he was making his first visit to their home. A surprise visit, he had not spoken to them in years. Nothing hurtful or wrong, just overly involved in his new life. He waited at the curb by their house until he saw his grandfather arrive home from work. Josh got out of the car and slowly walked to the door, with every step feeling heavier with the weight of the distance in their relationship. After ringing the doorbell, the black wooden door opened slowly and there stood his grandfather, silently staring at him. Josh’s heart pounded hard as he uttered the words, “Hi, Grandpa.” Then, without saying a word, his grandfather slowly closed the door. Josh, confused, stood at the closed door for an unusually long time before returning to his car. He never imagined the stony silent reception. If his grandfather was not going to welcome him back into his life, he would have preferred a heated argument, a good fight to at least feel justified in the strained relationship. But now what? Was restoring the relationship worth the hurt? How we respond to others when they hurt us is a big deal to Jesus! The morning after Jesus’ triumphant entry into the city on the back of a colt, He was traveling from Bethany to Jerusalem and teaching the disciples about the power of faith and prayer. He shared that whatever they asked of the Father and believed would happen, it would be granted. But then Jesus added this very crucial key for prayer, “Whenever you stand praying, forgive, if you have anything against anyone, so that your Father in heaven will also forgive you your transgressions.” (Mark 11:25). Our prayers must not be offered from an unforgiving heart. It is easy to see the harsh and unforgiving reaction of Josh’s grandfather, but harder to see our own heart as unforgiving. Yet what is our response when our neighbor lets their dog roam through our freshly planted flowers or when someone swiftly pulls into the parking space we have been patiently waiting for? How do you respond when you run into the woman you once called a friend until she shared your very sensitive and very private situation with others? Jesus knows that forgiveness does not come naturally for us. So much of Jesus’ teaching was about forgiveness. He taught that we are all sinners who have been forgiven and that when we recognize that hard truth, forgiving others should be our overflow response (Matthew 6:14-15). He elaborated that we should be prepared to forgive others often and repeatedly (Matthew 18:21-22). And, he knew we would be quick to point out others’ faults when he taught, “He who is without sin among you, let him be the first to throw a stone.” (John 8:7). Jesus modeled the way of forgiveness. At the crucifixion Jesus’ arms were nailed wide open on the cross in the ultimate act of forgiveness. 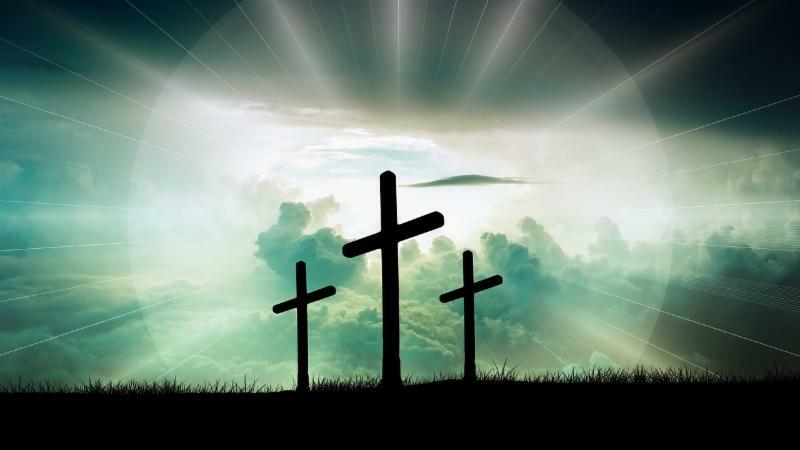 He laid down His life in order for sinners to be reconciled to the Father. Every sin, every time, has been forgiven for those who have faith in Jesus’ work on the cross (Ephesians 2:8). This Easter let’s celebrate His Resurrection by opening our hearts and our arms to embrace those who we need to forgive – open the door to restoring the relationships that need restoring.